Kofax AP Agility cuts time, cost and error from the Accounts Payable process. It does so by streamlining the work involved in receiving, validating, approving, reviewing and paying suppliers’ invoices. AP Agility improves visibility of the entire AP automation process, ensuring compliance to regulation and internal rules/procedures, and helps Kofax customers manage cash flow better. Smart Multichannel Invoice Capture & Validation Beginning with the smart capture of supplier invoices, regardless of how they are received, what currency they must be converted to, and in what format, Kofax AP Agility delivers a crisp, clear digital image of all invoices to everyone who needs them. AP Agility transforms all invoice information, including header, supplier, line item and totals data, into digital formats ready for automated processing. Digitize invoices and other AP-related documents for archive & compliance purposes, and for better visibility internally. Process information from invoices and other AP documents faster, more productively, more accurately, and with better visibility, for improved productivity and control at lower cost. Establish new levels of engagement & collaboration through information-rich AP process automation, optimization, and analytics. By radically transforming and simplifying the information intensive interactions that typify AP processes, increase the flexibility of financial operations. Enabling Kofax customers to accept invoices through paper, fax, email, EDI, XML and mobile channels, delivering high quality digital images for use throughout AP processing. It also efficiently extracts and validates supplier, header, line item and amount data, so that AP workflows can be automatically driven by that information. Enabling high levels of touchless processing being achieved. Where human intervention is needed, the solution’s dynamic and extensible AP workflows make that intervention efficient and productive. Allows fast and easy integration to any ERP and provides out-of-the-box (OOTB) integration to Microsoft Dynamics AX (2009 and 2012). In this version, we also include a specification for integration with PeopleSoft. Additional ERP integration is planned in future versions either out-of-the-box or through integration specification documentation. Providing insight into productivity, invoice status, removing bottlenecks, cash management and compliance. Now available for AP Agility as a hosted annual subscription service only. The portal is used by vendors to submit invoices, track invoice status and collaborate with accounts payable. Qualified vendors are provided a login URL (by the buyer) for access to the portal, where they can self-register, create a branded home page and gain access to their personal dashboards. Major advantages of the portal are reduced invoice processing costs, reduced errors, improved processing time for processing payments, and greatly reduced supplier inquiries. Capture information from multiple devices and sources, including mobile devices, web portals, scanners and MFPs, faxes, emails, electronic files, and XML / EDI data streams. Enhance, classify, separate, extract, and validate all invoices and invoice data, whether structured or unstructured. Leverage pre-built Kofax Invoice Transformation that boosts invoice recognition and processing on day #1. Exploit automatic invoice learning to maintain productivity on new invoice types. Avoid duplication of PO, Supplier/Vendor, GL Account and Invoice Information. Automate workflow to streamline AP processing and improve productivity of AP staff, approvers, etc. Graphically design process flows, approval rules and business controls to continually optimize AP processes. Use pre-built and flexible ERP coonectivity to integrate with master data in systems of record. Achieve cashflow visibility and optimization. Gain visibility and insight to every stage of the AP automation cycle, from capture and transformation through validation, approval and posting. Reduce software installation footprint by using browser-based interfaces for all users. Leverage multi-tier, componentized architecture for flexibility of deployment, fault tolerance and ease of maintenance. Self-service invoice submission significantly reduces costs for suppliers and buyers. Suppliers eliminate the costs, labor and delays associated with invoice printing and mailing. Suppliers also eliminate the risk of payment delays due to lags in invoice receipt. Buyers eliminate mailroom costs of invoice receipt, handglin, sorting and scanning. As an added benefit, both supplier and buyer achieve increased invoice accuracy while reducing their impact on the environment. Kofax AP Agility on the cloud is a smart process application built on the TotalAgility® Cloud platform, available in a TotalAgility multi-tenant or dedicated Azure® hosted SaaS subscription environment. Kofax AP Agility on the cloud offers functionality similar to the on-premise solution, while providing the benefits of lower implementation and maintenance costs and minimal reliance IT resources. UI elements for fields and columns, messages and workflow items in English, French, Castilian Spanish, German, Italian, Brazilian Portuguese. Speed. Automatic invoice capture, deadline-driven workflows and a “no rekeying” approach accelerate end-to-end AP processing. Visibility. 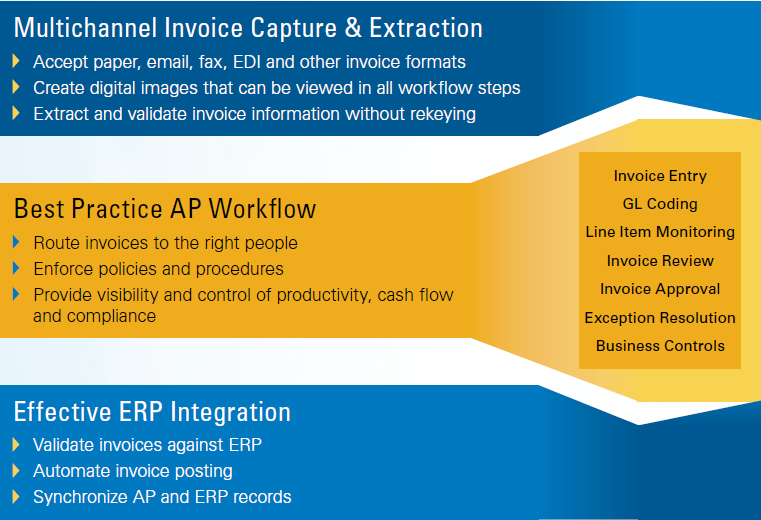 Invoice and AP workflow information easily viewed and analyzed. Cost. Reduced human touch and more efficient approval processing cuts cost per invoice. Control. Audit trails automatically created, business controls enforced, issues quickly escalated. Accuracy. Smart invoice data capture and cross-referencing to master data radically reduces errors. Cash Optimization. Early pay and dynamic discount opportunities identified and alerted. ERP invoice posting accelerated. Ease of deployment. Rapid configuration and implementation on-premise or in cloud achieves go-live quickly. Ease of use. Browser-independent user interfaces for invoice capture/review and AP approval, including for mobile workers. Ease of Change. Fast, achievable process improvement using built-in visual design of workflows, business controls, user screens, etc. Microsoft Affinity. For organizations that leverage Microsoft Dynamics AX, Kofax AP Automation is pre-integrated to this and other Microsoft technologies to allow swift, easy deployment in a Microsoft-centric environment. Multiple ERP integrate. The “outside in” approach of AP Agility allows for common business rules and resources to be shared and leveraged in cases where multiple ERPs are integrated for different business units) with a single instance of AP Agility. Options are available for out of the box AX integration or non AX integration. Remove Paper. Make crystal clear digital images available to everyone, preserving the value of “seeing the invoice” while enabling faster and parallel processing. What functionality does Kofax AP Agility include? The solution also incorporates functionality equivalent to the Invoice Processing Solution for KTM, to improve efficiency and accuracy of invoice capture and extraction. Without parallel in the industry, we efficiently digitize invoices and other documents from any source, accurately extract critical business information from them and automatically verify against master data records of supplier/vendor, PO, receipt and GL account information. Kofax AP Agility streamlines workflow, enforces business controls more effectively, provides clear and actionable visibility of AP performance, and drives continuous process improvement more quickly than any other provider. Over 1,000 organizations worldwide rely on Kofax to drive invoicing and AP excellence. Kofax’s 400+ experienced AP professionals are regularly cited by customers as critical to their decision to choose Kofax. Executive directive to move to cloud (have other SaaS products). Capital expense versus operational expenditures assessment. Limited IT resources or skill sets. Do not want to support, maintain applications. Minimal IT infrastructure in house. Need to assess cloud versus on premise options. Cut cost, time and error from your accounts payable processes while adding visibility, control and agility for better cash management. Contact us for more information regarding Kofax AP Agility. Latourrette Consulting is a Certified Kofax Partner in Portugal/USA/Brasil/Colombia/España/Nederland.